There may be a healthy selection of new PlayStation kits coming your way in the near future. Images of unannounced bundle boxes have surfaced over at Slickdeals, courtesy of Scream777, who claims to work at a package production facility that makes 'em. 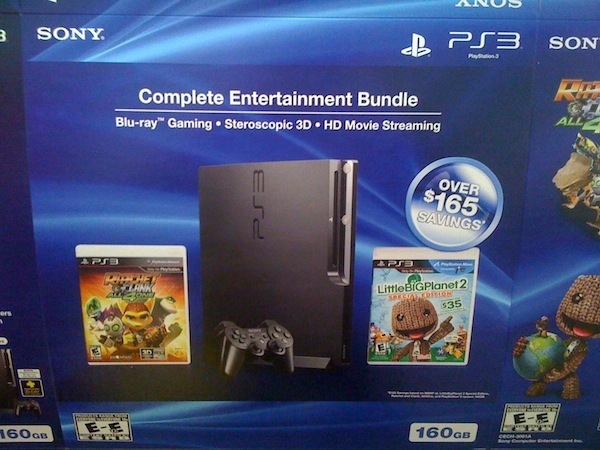 Those include a previously unknown Mayhem Edition PS Move kit with a Sharpshooter peripheral and the newest Resistance and Killzone titles, while a Complete Entertainment Bundle packs a 160GB PS3 Slim with a free month of PlayStation Plus and the latest Little Big Planet and Ratchet and Clank. Gaming blog Gimme Gimme Games claims that the CEB will be $250, with Scream777 noting that its order invoice lists it as a Black Friday special. Adding credence to the leak, said poster also threw in box shots of the 320GB Uncharted 3 bundle andGoldeneye 007: Reloaded Sharpshooter set -- both of which are currently available for pre-order. Here's to hoping it all proves true, but in the meantime, you'll find more details in the links below. Guests online: 790. Total online: 791.